This new and enlarged edition of a work first published 1993 provides an in-depth study of one of the most challenging hypotheses advanced by Edward Thompson in his Making ofthe English Working Class (1963) – that there was a radical tradition running underground through the years of repression, linking the 1790s to the radicalism of the early nineteenth century. Like its inspiration, this book also draws on West Riding evidence, notably that provided by the Huddersfie1d area, which the Report of the Proceedings under Commissions of Oyer and Terminer and Gaol Delivery for the County ofYork (1813) dubbed ‘a metropolis of discontent’. In the Colne, Holme and middle Calder valleys, from Marsden and Holmfirth to Mirfield and Dewsbury, communities of textile workers provided fertile ground for men (and some women) determined to safeguard their families and homes and jobs by constitutional or, if necessary, other means against the threats posed by industrial change and an unsym­pathetic, aristocratic government. The stimulus to the research which produced this book was the discovery of a cache of correspondence to and from Joseph Radcliffe of Milnsbridge House, the magistrate who earned a baronetcy for his vigorous pursuit and suppression of Luddite activity in 1812 and 1813. These, together with better-known sources ­chiefly other Radcliffe papers, Home OffIce papers, and the Wentworth Woodhouse muniments – have enabled Brooke and Kipling to piece together a remarkable story which more than bears out Thompson’s inspired hunch of 1963. The authors are both local historians with a keen sense of place and a good understanding of local conditions which they use to create a plausible narrative, relating and connecting local life stories. This book is populated with obscure men whose names are recorded in history in the tales told by witnesses, informers, defendants, and prosecutors when their activities brought them to the attention of magistrates and judges. The episodes studied here are well known, though not usually in such detail. The story begins with the ‘Jacobin’ years of the early 1790s when readers of Paine were inspired by revolutionary events in France. Then came years of hunger and repression, the United Britons and the Croppers’ Institution, fruitless petitioning, and illegal oaths. 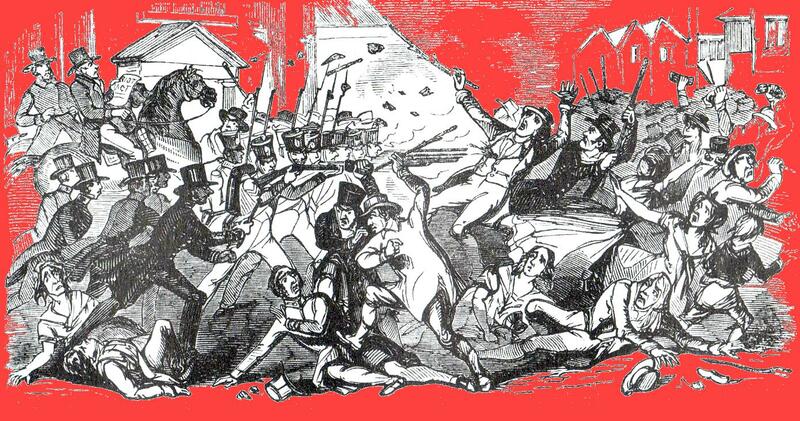 The Luddites of 1812 form the centrepiece of the book, with the attack on Rawfolds Mill, the assassination of William Horsfall, the trials at York, and the execution of those found guilty on largely untested and circumstantial or unreliable evidence. Beyond the shock of these events came the unrest of the post-war years, culminating in the Folly Hall rising of 1817, the reaction to the ‘Peterloo’ massacre in 1819, and the various risings attempted in the spring of 1820. Similar sounding names flit in and out of these episodes, suggesting possible if tenuous connections and probable influences. The’ authors extract what they can from the evidence, but they have no need to strain beyond the plausible. The actors in these events came from small communities; they were neighbours and relations. They had common experiences and grievances. Maybe they only held common names but some clearly were the same people, turning up on different occasions both legal and illegal, weaving by their presence the threads of the underground tradition. The cumula­tive evidence painstakingly assembled may be as circumstantial as that used to convict the Luddites, but at the level of civil proof the case is made. Of those who were caught, some were put to death, one (interned without trial) committed suicide in gaol, and others ended up in Australia. Of those who remained, what became of them after 1820? The final episode in the story finds a number of familiar names in the lists of supporters of the radical publisher, Richard Carlile, the re-creator of Thomas Paine and proponent of republicanism in the early 1820s ­names going back to the rising of 1817; even, possibly, to the United Britons of 1802. Given the degree of commitment shown by some of these men, it would have been surprising had they not turned up on more than one occasion. There are some surprises, though, not least the radicalism of the Taylor family of Marsden, including Enoch, the iron founder who with his brother built the shearing frames that the Luddites set out to destroy. But this chapter also contains a few more questionable passages. Some are straightforward factual mistakes: the French Revolutionary, Mirabeau, was not the mthor of the Systeme de la nature (by d’Holbach also known as Mirabaud). Some are surprising: the presentation of Carlile as a ‘dialectical materialist’ and ‘the leading British working class philosopher of the nineteenth century’ ignores the fact that Carlile was entirely innocent of the Hegelian dialectic and was merely the popular propagator of some of the standard commonplaces of the French Enlightenment, not least Mirabaud. Some are over-simplifications: the relative abstinence of Huddersfield men from later violent episodes may be attributable to Carlile’s influence, but it is more likely that for the next twenty years after 1825 the industrial spotlight shifted from the now-defunct croppers of the woollen industry to the handcombers of the worsted industry, centred on Bradford and Halifax, so it was Bradford, not Huddersfield, where violence broke out three times in the Chartist years. The final chapter offers a retrospective on ‘The Condescension of Posterity’, which makes some sound historiographical points about ways in which Luddism has been seen from Charlotte Bronte (1849) to Robert Reid (1988). There is a useful critical downgrading of one of Edward Thompson’s favourite sources, the nineteenth-century journalist Frank Peel, and some useful additional insights derived from minor recollections and references from those who claimed to remember or to have met those who took part. The desire of the authors to ‘rescue’ the Radicals, Republicans, and Luddites is all too clear, and they attempt to do so with remarkable restraint – except when they enthusiastically seek to link the ‘Ludding times’ with our own. This book is both a labour of love and of scholarship and can be read with pleasure on either – or both – counts. Labour History Review . Vol. 78. No. 3, December 2013.